Has Running Transformed Your Body? 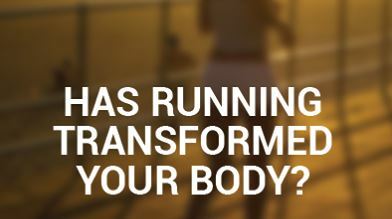 Did you transform your body through running? Share your story. I started running to lose baby weight….it worked and also led me into strength training and a healthier life style in general. Im not fast and I cant go far but I run! Yes. I started running at age 54. I’m now 56. I have lost over 30 lbs, I have strong legs. I have three bulging discs in my back that are manageable now. I have had disc replacement surgery in my neck and it still hurts especially during long runs…but I do it anyway. Last year I wore baggy clothes. This year I have nothing to wear….everything is too big; even the “pre gaining weight’ clothes are too big. I am doing my first half this Saturday. I have transformed from an “old” 54 to a very YOUNG 56!!!!! I have just started a c25k program a few months ago ;and have lost 9 pounds so far! Not to mention what it is doing for me mentally! Only makes me want to do more! Love it! I started running when I was 60 years old! I lost almost 50 pounds, lowered my cholesterol by 80+ points and had to buy all new clothes!!! Just started running again after about a 5 year break. Lost 33 pounds in 3 and a half months. 22 more to go to reach my goal weight. I’ve lost 20 pounds in 3 months. 5 more to hit my goal! I started walking and soon discovered I was a runner! Down 92 lbs, 104 inches and 5 sizes! I’m running my first half marathon in less than 3 weeks! Running has given me so much more than I dreamed possible. Thank God for being with me and guiding me every step of the way! never mind body… it has transformed my soul!! – running the Boston Marathon in 7 days. I’m down 45 pounds (all thru running) and now my running helps me maintain/keep that weight off! Love my new lifestyle and physical transformation! Had a great time Saturday at my first 1/2 marathon! And came in 15 min faster then my sub 3 hour goal. And I also have had a massive transformation in the past year losing over 70 lbs and going from non runner to 1/2 marathon runner! Super proud of this accomplishment! Transformed my body somewhat, but I had always been athletic as was a former soccer player, dancer, short distance track runner, gymnast, volleyball, softball and tennis player. But the biggest transformation was with my mental health. It gave/gives mepeace, a time to relax, clarity, time to reflect, time to plan, time to laugh at myself, and an opportunity to continuing trying to like me with all of my “perfect imperfections”. It reminds me that I will always be a work in progress. I had lost 15 pounds and then started running 7 months ago at age 52 and have lost 17 more pounds. But Wow!, the loss of inches is what I have noticed more than anything else due to the running. I am down 2 sizes and am especially loving the way running has gotten rid of the belly fat. And I feel great. I run my first half at the end of May. Q&A Do you Run with Sunglassed on?